Jean-Baptiste-Camille Corot (1796-1875) was a prominent French landscape and portrait painter. He was part of the Realism movement, as well as an important transitional figure, simultaneously employing elements of Neoclassicism while also expressing some of the ideals that would come to define Impressionism, namely use of plein-air (outdoor) painting. This late piece of Corot's is rather different from most of his oeuvre, which utilized very exacting brushwork and crisp lines. This painting employs looser brushwork and a somewhat hazier view of the landscape. This results in a sense of the wind blowing through the scene, successfully communicating the movement of the air, foliage, and water. 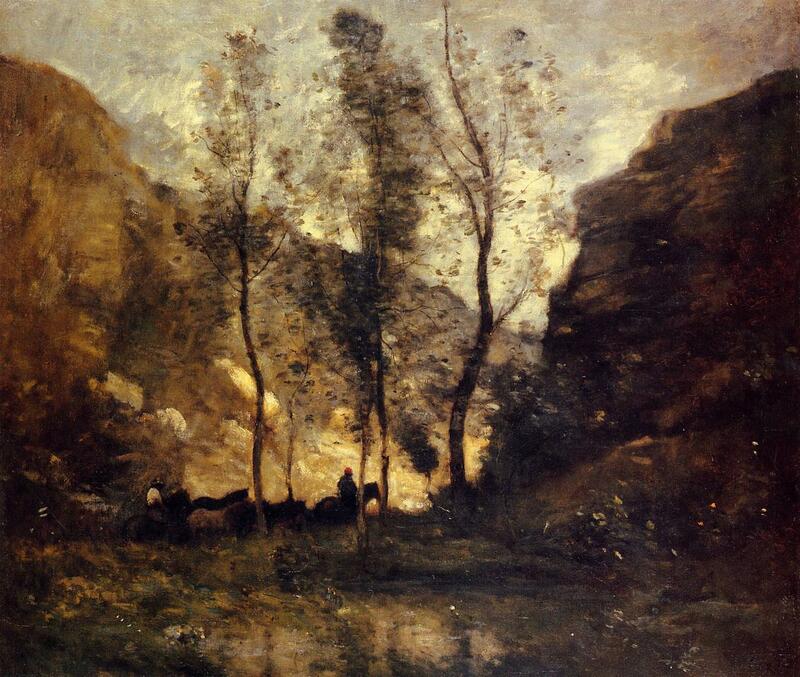 I am also fascinated by the use of light; with a slightly yellowish cast, Corot communicates a late afternoon setting. Furthermore, his use of the figures is interesting. While the painting is entitled Smugglers, their procession plays a very small role in the overall impression of the painting, and they seem to blend into the landscape. Finally I return to the brushwork, for Corot used very similar strokes to paint most of the elements, whether clouds, leaves, rock, or water, uniting the scene in that afternoon breeze.